Casa Rosa is the new delightful addition to ThriftyUmbria.com. 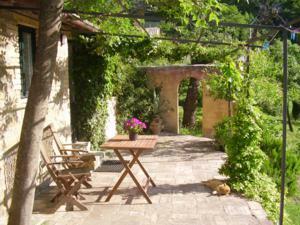 Great prices, natural surroundings and a splendid swimming pool match the typically Umbrian interiors. It is a traditional stone farmhouse placed high on the green hillsides of Umbria, in central Italy, 10 kilometers out of Assisi. The home is separated into 4 family Umbria apartments, one sizable dwelling occupying the full first floor, 2 more compact flats sharing ground level floor and the other apartment within the transformed stables. The place is surrounded by woodlands and cultivated fields, situated on a spur it has wide ranging sights on the National Park of Mount Subasio. Along the stream are waterfalls and natural ponds to go swimming in the summer time. The hillsides, woodlands and valleys give several potential paths for walks. The slopes and groves are rich with abundant wild animals even noticed at the farm from time to time. The pool is 6 by 12 meters in size and shared with the other apartments occupants. It rests positioned a little bit over the home in a commanding position with beautiful vistas above the national reserve. The swimming pool is surrounded by verdant plants on one side, and on the other side by a broad terrace paved with local rock with sun-beds and deck chairs meant for lounging and sun tanning. Right here there is also a grill as well as a gazebo. A shower is at one end of the patio on a rock wall. The elegant gardens include terraces, patios along with backyard furnishings to enjoy them comfortably. You will find a typical pizza wood burning oven. It is a perfect place for relaxation, peace of mind and to get away from everything. From Casa Rosa you'll be able to take treks inside the Mount Subasio nature park. All Umbria apartments are fully self-catered, with their own kitchen and restroom and veranda or outdoor patio. Every one of the apartment rentals are simply yet comfortably furnished, attractively decorated, and have full central heating system. Casa Rosa's position means that in summertime it is typically less hot compared with almost all the rest of Italy. Bath towels and bed-linen are provided and a infant's cot is free upon request. We have a phone that guests can make use of. No need to go out to restaurants. Eat in your house with our cook, take pleasure in authentic Italian cuisine, dining out at your house or perhaps in one of the numerous wonderful locations around the farmhouse. And, why not get in on the preparation procedure thanks to our cook? Understanding, via a half-day cooking lessons, how you can prepare typical Umbrian recipes which you can then savor within the peaceful ambiance of Casa Rosa. Discover more on Casa Rosa here.